I thought it would be fun to do a regular post each week detailing some things from the week I loved. I'll probably focus on mostly my favorite workouts/meals of the week, but if I see a good concert, interesting movies or whatnot, I'll throw those in too! 1. Abs and Superset Training: I really loved this abs and upper body workout that I put on the schedule Wednesday. It is fast paced and over before you know it, but my arms were shaking afterwards! I know this makes me a bit crazy, but I love that Jello feeling in my muscles when I've done a tough workout! 2. My Stretch Sheet: I decided to jot down all of the stretches I enjoy doing, put them in a spreadsheet and categorize them by the body part it benefits. Every evening I look at the sheet and randomly choose a handful of stretches based on my needs that night and where I feel I need stretching the most. It's made doing my little stretch routine in the evenings all the more easy! I've noticed that I feel a lot better and am sleeping even harder at night. 1. 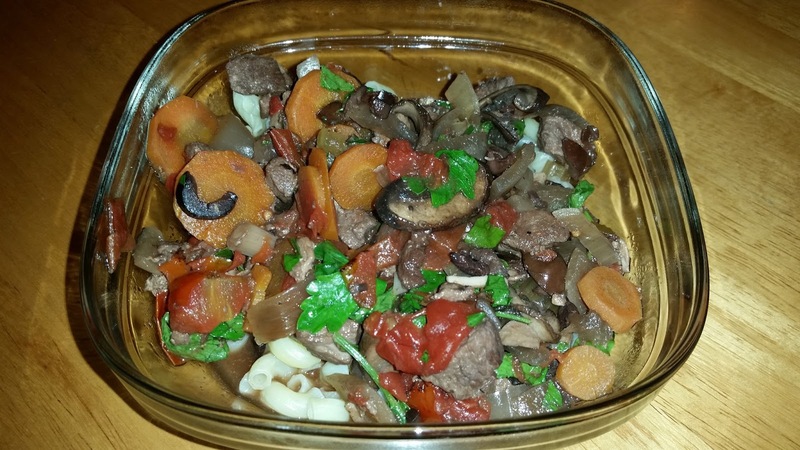 Cooking Light's Beef Daube Provencal: This recipe definitely has become a frequent MVP in the menu rotation for us lately! It's a slow cooker recipe (there is some initial prep involved) but it tastes like a classic Beef Bourguignon, and there are some very unique elements to the stew that give it a lot of character. Don't let the dried mushrooms on the ingredient list scare you off! I live in foodie paradise Portland and even I have trouble finding dried mushrooms, but I have easily substituted fresh and it works out just fine. Do increase the amount of broth if you do this since you won't have the soaking liquid from the dried mushrooms. I also use one pound of beef chunks instead of two. You could totally eat this just on its own, but it's really nice over egg noodles, rice or a sturdy pasta such a penne or elbow macaroni. I imagine that quinoa and barley would also be tasty additions if you didn't want to use rice or pasta. It makes a very hearty six servings, which is great for lunch leftovers or for stashing extra portions in the freezer for a future lunch or dinner. 2. Cooking Light's Whole Grain Burrito Bowl: So on paper you may say that this is a very basic burrito bowl and I myself certainly wasn't expecting to become obsessed with it, but here we are. It is another frequent star on our weekly menus, and I'm going to go on record saying that it's one of my favorite meals. While everything in it is basic and it's easy to put together, the combination of everything in it makes my brain explode. It's beautiful to look at and there's so many different textures, flavors and temperature differences going on that it keeps me excited about every single bite. That's exactly how healthy eating should work. You should be excited and engaged by your meals, and this is definitely one of those. You can somewhat play with the ingredients too. I forgot to buy canned chipotles this week, so I just used a teaspoon of harissa in the beans instead (and actually liked that better). I use white rice that I cook myself (not sure why CL is all about the precooked rice). I leave the jalapenos out of the pico. I also use cheddar cheese because that's what I prefer. If you wanted to bulk up the meal, you could add grilled chicken, beef or even grilled portobello mushrooms to the bowl. I think it's great with just the elements listed but you know, do your thing. 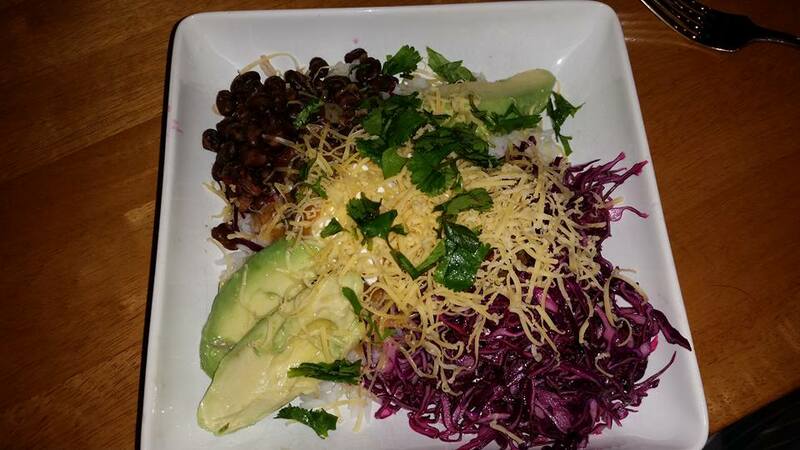 Whatever you do, don't skip the cabbage salad! It's the best part and adds so much beautiful color and crunch to the bowl. If you have a mandolin, use it to slice the cabbage whisper thin basically.